Thanks for the Link Click here to see BSS's post. Second - request to see the report that the doctor writes prior to it being sent to the Benefits Agency. This again is your right and part of GMC's "Good Medical Practice" guidelines on confidentiality. You can directly request your report from ATOS. If you disagree with the report, you must challenge it. Third - if ATOS or other agency hold a file on you, you request to see a copy of all data held under Subject Access request, from the Data Protection Act - a simple letter requesting such data, together with a cheque for £10 is sufficient. 3 - Those doctors whose practice falls below the level of competence expected of a reasonable medical practitioner will have to improve their standards if they are to continue practising medicine. 4 - Finally, it may make ATOS think twice before discriminating against disabled doctors in this way - which would be nice. 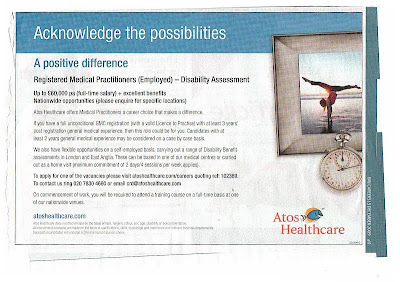 ATOS flouts Disability Discrimination Act - yes we know that, but how? ATOS demands that their 60,000 pound salaries go only to healthy doctors! that is doctors who are free of General Medical Council Conditions. Although there are other reasons for having conditions on your General Medical Council registration, a significant number of doctors with disabilities have conditions on the registration solely because of their Disability. Therefore "unconditional registration" excludes a significant number of disabled doctors! This advertisement flouts Disability Discrimination Legislation. An employer cannot advertise for people without a disability, unless it materially affects their ability to do the job. Having a disability does not affect your ability to assess people for state benefits. Nice to know that no one with a health problem is going to get a job assessing people with health problems. I have just applied for two jobs in Occupational Health for which I was well qualified, and one at least said I interviewed well. Nonetheless, no success! The trouble is, that I got above myself during the interviews and mentioned the "B word" - (ie Bipolar disorder). It is difficult to explain my Curriculum Vitae without doing so. Why would I leave a successful career in neurosurgery and end up in Occupational Health? at least not without a large brood of children. It is not a natural progression. And why the Book? Nonetheless, mentioning the B word, in the eyes of Occupational Health Physicians, disqualifies me from paid employment - and certainly not as one of them! Occupational Health and Psychiatry seem to be the two medical specialties most steeped in prejudice. These specialities run on opinion, rather than objective tests. More than any other, their professional judgements rely solely on professional prejudices, which surface quickly and easily. Both would rather employ a donkey with no brain than a doctor who admits to a mental health problem. Admitting a mental health problem shows a gross lack of insight. Not unlike telling a Palestinian you are Jewish, or a Gorbals Catholic, you are a Protestant - best not done unless you are wearing running shoes. The reaction of an Occupational Health Physician to mental health problems is to make the sign of the cross and backpedal fast in the opposite direction whilst throwing garlic over their left shoulder. I half expect them to refer me to the GMC for having the temerity to apply for their "nice" job! My fault of course, I mentioned my "disability" at the interview. "Most moslems think that Abu Hamzi is some kind of nutter from the East End"
Using the word "Nutter" has the same connotations for people with mental health problems as the other N word has for coloured people. Yet it slipped out of her mouth with the elegance of a rattle snake. Perhaps I am being oversensitive, but without a period of "over sensitivity" we are not going to change attitudes. I for one, will not give up my seat at the back of the bus, nor my place in the NHS queue to someone with "better mental health". 1 - Like all politicians Nick Griffin is a dishonest Numpty, but he alone on that panel knows that about himself. 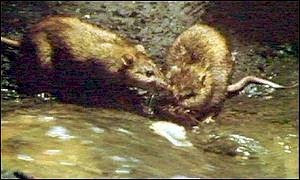 The rest consider themselves as part of the "Political Elite". Nick Griffin's power comes in part from this self knowledge and because he is part not the "Political Elite"
2 - There is nothing wrong with the East End, but it is better able to defend itself than most people with problematic mental health. Last week a crowd of doctors from Doctors.net.uk started a unpleasant game of "Space Invaders" attacking me and my blog. Doctors.net.uk (DNUK) is a private forum for doctors. You have to be a registered medical practitioner to join. Within the forum doctors are allowed to post either under their own names or under closed profiles, where their identities are known to only the forum moderators. Posts are voted on, much like the Comment is Free section of the Guardian website. This leads doctors to compete for votes in order to get a "Top Quality Post". A Top Quality Post (TQP) is any post in the top five voting for any given week. Competition for a TQP is fierce, TQPs get a link in the right hand margin of the forum drawing other doctors attention to them. At this stage, they immediately get more votes and the competition hots up. Under these circumstances, it is not surprising that behaviour deteriorates. Doctors are a frustrated lot and by no means are they all bad people. Most people, like myself, set out on the medical path with strong ideals and a belief in human kindness and compassion. These beliefs have been trampled on by the system within which they find themselves. Doctors are largely held prisoner in a culture dominated by fear and greed, otherwise known as the NHS. Unsurprisingly many "go native" and support the target driven, performance indicated, management dominated hands that feed them. I objected and all hell broke loose. The abuse I personally received for spoiling their fun was spectacular. It ended after a week. A week in which I described the incident on Doctor Bloggs (Click) was banned from the forum, and was threatened with lawyers. After three days the thread was withdraw and after six days the moderators agreed to delete my data and posts, all discussion of me, my mental health and the book Mood Mapping presently on the forum and in the future. How did this happen? Firstly, doctors believe that they can be as flippant with patient confidentiality as the Department of Health, Secondly, altough it is accepted that you no longer make jokes about coloured, disabled or gay patients and doctors, people with mental health problems have no such rights. Thirdly, doctors consider DNUK a safe place to vent their frustration, especially when posting from behind closed profiles. It is not safe, as I demonstrated. I broke their Terms and Conditions, discussed the forum outside DNUK and have been banned, but I am not the only hole in the sieve. The General Medical Council (GMC) has close links with DNUK and it can reasonably be assumed that everything that goes on within that forum does so with the tacit acceptance and approval of the General Medical Council. I say that because the forum frequently publishes recognisable patient details without patient consent, and the GMC takes no action. Members of the GMC Council post on the forum. Although in fairness to the GMC, they have guidelines in place to prevent doctors stigmatising patients. In addition, nurses are referred to as "noctors" and "clinical mistakes" that they might or might not make are gleefully recounted. There are many "hate threads" against nurses or any other group that might offend the DNUK collective. Each attempting to be more trite and vitriolic than the last in order to attract more votes. Doctors need a forum where they can openly discuss their concerns and where such discussions lead to action, not further increase frustration. Closed profiles give a false sense of security. If you say something, you should be prepared to stand by it or apologise. The General Medical Council has full access to all discussions in the DNUK. They may also request further details about any exchange on DNUK should they require them. Doctors do not need to discuss issues behind closed doors. In a world where patients are sent letters in the post, detailing the spread of their cancer and their life expectancy, there is no excuse for doctors to hide from their public. Their public can take whatever doctors say and judge accordingly. Moreover, many doctors would be surprised how supportive the public are. Don't get mad, Get equal treatment is a campaign against stigma in the NHS. For too long, I have replied to letters emails detailing medical attitudes and treatment mistakes based on a patient's mental health history with spineless and useless platitudes. In 2008 I was voted Mind Mental Health Champion because of my work with the Doctors' Support Network. The Doctors' Support Network was set up to tackle discrimination based on mental health within the medical profession. There have been some successes and some failures. The purpose of this blog is to start to right those wrongs and to provide a forum for people who have been medically discriminated against on account of their mental health history. If you want to post your story - add it to the comments section, if you want to make a post - email me, and I will add your name to the list of people who can post here. People with poor mental health and mental health problems are valued members of society as much as any other group, whether disabled or belonging to an ethnic, religious or cultural minority. Yes we want integration and we want integration for everyone. My mission is to "Change the way we manage our mental and physical health and have some fun whilst so doing"
This campaign is about discrimination within the NHS against people with mental health problems. This blog is about putting words to the experience. Each day, people are discriminated against because they have the label "Nutter" or "The skinnies". Language shapes thought, and in order to change thinking we must first change language. The Health Care Industry discriminates against people with poor mental health. The stories are legion and this is a place to collect such stories.